Do your feet remind you of your favorite superhero? If you have a hammertoe, it’s likely that one look will remind you that Thor is back! Thor: The Dark World hit theaters and was greeted by outstanding box office sales and largely positive reviews. If you’re not a Marvel comic fan, here’s the scoop. 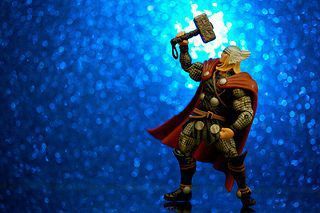 Thor is a superhero from the planet Asgard with a fitting Scandinaviangod look. The combination of ancient myth and futuristic sci-fi might throw you off, but the typical good versus evil storyline beats to the typical comic book beat—with a twist. Super Man can fly, Spider Man can throw a web and a scale a building, and Thor—well, he can throw a magical hammer with the best of them. There’s a lot of pressure when you’re a hammer-wielding superhero—especially on the toes. Forward propulsion is necessary to throw, and these extremities support all of the excess weight. Even for us Clark Kent and Lois Lane types, the toes are vital to our every movement. So, what happens when they become deformed? Hammertoe is caused by a muscular imbalance and too-tight shoes are often to blame. When forced into a scrunched position, the middle joint of the second toe is particularly susceptible. It goes up causing pain, especially due to friction from your shoes. Heroic measures are rarely needed when it comes to this toe deformity, since conservative treatments are often very effective. Inspect your feet daily, and call the experts at Austin Foot and Ankle Specialists at the first sign of trouble. Let Dr. Craig H. Thomajan DPM, FACFAS and Dr. Shine John DPM, FACFAS rescue your feet from the evils of ill-fitting shoes and poor foot mechanics. Call for an appointment today at (512) 328-8900, or schedule an appointment online.